Will Lich’s Mastery be THE ONLY viable strategy in Standard?This card is poised to completely warp Standard! It is a draw engine of unprecedented power. Imagine for a moment you were playing a big format and ran Lich’s Mastery alongside Nourishing Shoal… The ability to draw cards with little to no incremental mana investment (after the initial six mana investment, of course) is unprecedented! Yawgmoth’s Will limits access to your graveyard. This Legendary Enchantment has no such limitations. White is a natural pair to Lich’s Mastery in Standard. Renewed Faith is one of the most obvious best buddies. It cycles to help you hit land drops early. Later on, you can draw six — count ’em six — extra cards for just one card! Fumigate is also an awesome addition. The ability to gain one life per creature killed takes on new meaning when each of those creatures represents even more card advantage. 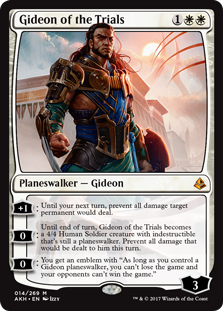 But what about Gideon of the Trials? Is there a particular synergy with this Planeswalker that can also prevent you from losing the game? Yes! Not only does Gideon rumble (giving your combo-control deck a way to win) but it can protect you from losing the game by losing your Lich’s Mastery. Further, it gives you a redundant synergy with Glorious End. Any two of the three — Lich’s Mastery, Gideon of the Trials, and Glorious End — are great together! Glorious End + Gideon of the Trials was a combo that never quite hit in Standard. Is it awesome? Probably… But it never quite hit. What happens when you add a third leg to the stool? What happens when that third leg has hexproof? Glorious End is just awesome with Lich’s Mastery. Can you just Time Walk your opponent with Lich’s Mastery in play? Sure. You can also Fog them, Counterspell them, and generally laugh at them from behind your Legendary Enchantment while they expend resources. But did you ever think about this? Cast Glorious End on their Turn Five. Maybe on their upkeep? Untap and play the Lich’s Mastery in your hand! What if you don’t have a Lich’s Mastery in your hand… yet? The planned End-Mastery play is a big game, but what might be even more fun is the desperate Glorious End-into-praying-to-draw-Lich’s-Mastery. All part of the range. In this episode of Top Level Podcast, Pro Tour Champion Patrick Chapin and Resident Genius Michael J. Flores discuss all manner of builds around and including this seductive six drop. Black-White, Mardu, and even straight black takes are on the table. Gifted Aetherborn? Creatureless? A couple of big guys? A ton of lifelinking Knights? Give this one a listen and figure out how you want your BBB3 to go in the coming months. 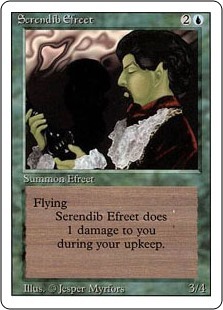 Despite its initial appearance, Serendib Efreet was a blue card.A good place to think about this most respected of Djinn is the Revised misprint, Serendib Efreet. Serendib Efreet was a 3/4 flying creature for U2 (blue, despite the card frame)… With a drawback! Serendib Efreet saw play in a variety of decks, and fast multicolored aggressive mages would often dip into blue to play it. Again, despite the self-inflicted damage. Dominaria’s Djinn is much harder to cast, sure. That is a lot of blue pips in the top-right! But, the payoff is also much greater. In a deck with, say, twenty-five Islands, Tempest Djinn’s floor is a Serendib Efreet with no drawback. Each and every incremental Island will make it a faster and faster racer. 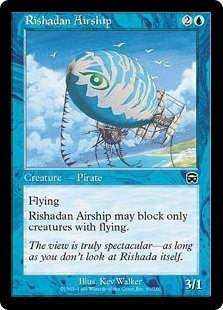 Unlike Rishadan Airship, Tempest Djinn can blockIn its era, Rishadan Airship was one of the most important creatures played in the Blue Skies archetype. Rishadan Airship was not great in very many other decks; it could not block consistently, and even when it could block, it would probably die. But offense-wise? Blue Skies was one of the best decks in Masques Block Constructed + was a favorite of some of the best Hall of Famers in Standard. Tempest Djinn is like a more flexible Rishadan Airship. 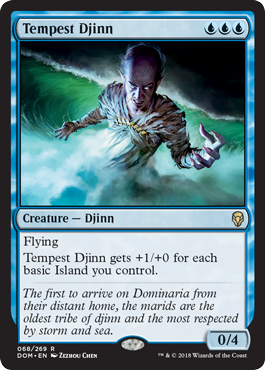 Again assuming an Islands-heavy (if not Islands-only) mana base, Tempest Djinn presents the same offense as Rishadan Airship — at least — but can also block. Not only that: It can block and often survive! This flexibility is one of the most important aspects of Tempest Djinn. You can tap out for it on turn three, Skies-style to race… Or you can tap out for it on turn three to block a Red Deck’s 3/2 attackers. 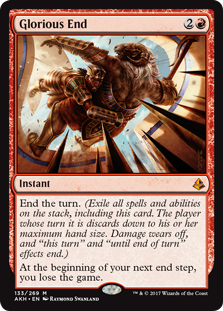 Or — get this — you can tap out for Tempest Djinn, block… And then back over itself (and generally for four damage). Mike is wild about it. Let’s start with the basics: Warkite Marauder is a pretty cool Magic: The Gathering Card. We’ve seen people play cards on the order of Welkin Tern — a blue 2/1 flyer for two mana with a disadvantage — in Standard Pro Tours. Warkite Marauder is loads better than the best Vaporkin! It simply doesn’t have the disadvantage. Meaning, Warkite Marauder can block whomever it wants. But that’s not all! 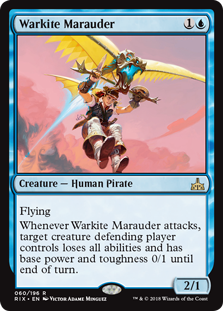 As a 2/1 creature with flying, Warkite Marauder is not particularly resilient. It’s cheap — evasive maybe — but also small. Basically anything will kill a Warkite Marauder in combat. So, the ability to remove flying from a potential blocker is very useful. Get in there for two! Here’s the thing: A fair Warkite Marauder is pretty good. Better, in fact, than cards good players have played in recent years. But no one is saying you should “play fair” with it. No sir! The new style of U/R God-Pharaoh’s Gift is basically a Red Aggro deck… But with a graveyard-combo twist. God-Pharaoh’s Gift can correct the solo toughness of this Human Pirate, and haste enhances its combat trigger. The U/R deck can act like Red Aggro (starting with Bomat Courier on turn one, but just happens to have a more explosive relentless end game. But the real value of this Human Pirate? Teaming up with Walking Ballista and Fanatical Firebrand, Warkite Marauder can “build a Terminate” … But it’s better than that! This is a “Terminate” that can take care of The Scarab God! Not only will Warkite Marauder pull The Scarab God’s toughness down to one (where it will be easy prey for one direct damage)… But because The Scarab God will lose all abilities, it won’t come back. Warkite Marauder is just one of dozens of cards discussed in this episode! Most of the time is actually devoted to Dominaria. Check it out! A 3/4 flyer for four mana is probably not good enough on its own. That said, there have been highly successful 3/4 flyers — Angels even — in the not-so-distant past. All it takes is one good ability and that 3/4 flyer can jump all the way to Staple. 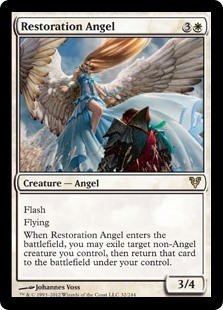 Restoration AngelLike Shalai, Restoration Angel was a 3/4 flying Angel for only four mana. It ended up dominating Standard thanks to synergy with Thragtusk. 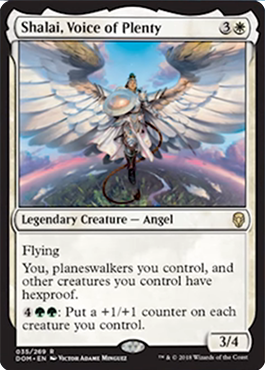 Restoration Angel was also great at sliding into the Red Zone thanks to end of turn Flash, after a control deck had tapped for main-phase sweepers. While Restoration Angel was mostly a Standard card (again due to its extraordinary synergy with Thragtusk), it has seen play in larger formats like Modern, often playing with Kitchen Finks or Flickerwisp. Remember what we said a second ago about just one good ability? Well Shalai, Voice of Plenty has more than one! Mike focuses on this ability (while Patrick largely focuses on the other). 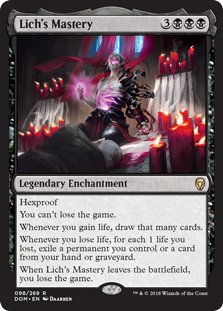 There are many implications to giving not only you but basically everything else on your side of the table hexproof, but one of the coolest is that it turns off Shock. Or in Modern, it turns off Lightning Bolt. You can’t be the target of the Shock. None of your other creatures can be the target of the Shock. In fact, the Shock can basically only target Shalai. That means, until the bad guys have a second Shock, that first Shock isn’t going to be very shocking at all. What’s more, given Shalai’s second ability, you can pull it out of even double Shock range with one green activation. Shalai’s “Hexproof” ability is powerful in Modern. Because Modern has cards like Aether Vial and especially Chord of Calling, the ability to drop Shalai at instant speed adds a powerful dimension. Current G/W decks, for instance, can slot in [at least one copy of] Shalai as a silver bullet. You can respond to, say, twenty copies of Grapeshot, spoiling the opponent’s combo finish. Even more interestingly, though, Shalai can fill the role of Ezuri, Renegade Leader or Walking Ballista. Shalai is much, much, better than Walking Ballista as a Chord of Calling target, as the latter is generally an inappropriate target. 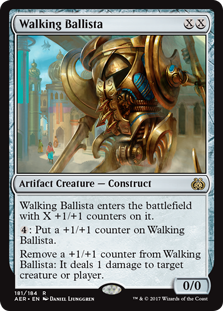 Walking BallistaG/W decks that can generate “infinite” mana will often use Walking Ballista as an endgame finisher. They make a ton of mana, and can kill however. Shuri might be an alternative. Infinite power from multiple creatures, rather than infinite one-point pings, might be slightly inferior (you need some attackers, you need them to be able to get through, you need a combat phase)… But if you are already playing 1-4 copies of Shuri for the hexproof ability, gaining Chord of Calling efficiency while saving a card slot or two might make sense. Without a doubt, Shalai, Voice of Plenty is going to shine in Standard. The one-two (rather four-five) punch with Lyra Dawnbringer is just too sweet. If you untap with Shalai, you can follow up with Lyra and swing for four. Four lifelink (not just three damage) while leaving a plausible defender. In some cases just tapping out for an awesome Angel might make sense… But it can still die. In this case, Lyra Dawnbringer will gain hexproof. So good luck getting through a flying, first strike, lifelink, and hexproof defender. Lyra will gobble up Glorybringer without even a scratch. It’s not like you can kill it with conventional removal. It is at least arguable that Shalai’s third ability will be even more potent in Standard than Modern (infinite possibilities notwithstanding). This ability is highly comparable to Gavony Township. 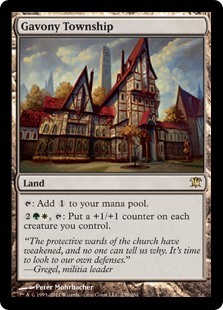 Gavony TownshipThe deck where you play Shalai is likely going to be G/W. You might have some late-game Llanowar Elves. This ability turns Elves into killers. But it also turns killers into more vicious killers. Just pulling Shalai and Lyra into the 6+ toughness range is going to be yuge. (They themselves will be yuge.) Shalai might not give itself hexproof, but massive toughness simply means it’s tough to kill. This week’s podcast clocks in at nearly an hour and a half. Shalai, Voice of Plenty is just the first Dominaria card we discuss.